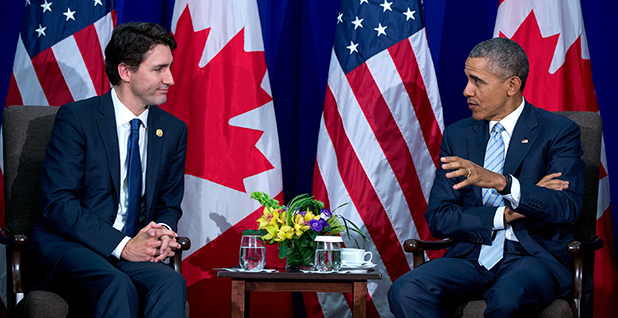 President Obama's meeting with Canadian Prime Minister Justin Trudeau today will focus heavily on climate change. While few major announcements are expected, White House and State Department officials said the two countries will work toward making last year's Paris climate change agreement a reality. Photo courtesy of the White House. Tomorrow's first-ever state visit between President Obama and Canadian Prime Minister Justin Trudeau seems unlikely to produce the kind of sweeping regulatory announcements on climate and clean energy that some greens have proposed. Yet even if the two countries offer a slate of aspirational targets rather than specific policy announcements, environmentalists say Trudeau's visit to Washington, D.C., will mark an important turning point in the U.S.-Canadian relationship on energy and climate change that can be built upon in the coming months. U.S. Special Envoy for Climate Change Todd Stern told reporters on a call yesterday that Canada's stance has shifted since Trudeau took office late last year, replacing the Conservative Party's Stephen Harper, who sometimes disputed climate science. "I will say that the climate relationship with Canada really just ramped up dramatically quickly," said Stern. He described Canada's role at the U.N. climate summit in Paris last year as "extraordinarily effective." "So they really -- they made a very positive splash," he said. The meeting and state dinner tomorrow, however, don't seem calculated to satisfy the climate community. Stern's outline of the climate and energy "deliverables" that are still being finalized did not include items environmentalists proposed in calls and letters ahead of the state visit. These included a U.S. pledge to stop drilling in the Arctic, new regulations on both sides of the border for existing oil and gas operations, and efforts to base future infrastructure decisions on climate considerations (ClimateWire, March 4). Instead, Stern hinted at a host of modest steps. For example, he indicated that Canada might adopt the U.S. goal of cutting oil and gas methane between 40 and 45 percent below 2012 levels by 2025. Greens warn that the United States might not meet that goal if U.S. EPA doesn't reverse course and promise to regulate existing wells. Stern also mentioned a possible announcement on fuel economy standards for heavy-duty vehicles, but it was unclear whether that would go beyond a plan to synchronize standards between the two countries. And Harper's government pledged last year that the Canadian standard would be aligned with the one EPA has proposed. Another opportunity for bilateral cooperation mentioned by Stern yesterday deals with "power infrastructure." A report by the Center for American Progress last week suggested that Canada and the United States could prepare the grid to accept more renewable energy. But with Canada still working on a pan-Canadian climate framework to be released later this year, it seems doubtful that the two leaders will circumvent that process to roll out major new utility-sector policies or regulations. Stern also mentioned a number of areas where Canada and the United States have collaborated in the past -- especially on reducing the harmful impacts of black carbon and methane in the Arctic. Canada chaired the Arctic Council immediately before the United States, which currently heads the organization of Arctic states. Besides curbing short-term climate forcers, the two countries could release announcements on science or adaptation for northern communities. Drilling does not seem to be on the agenda. Canada and Mexico have joined the United States in pushing for an amendment to the Montreal Protocol on Substances that Deplete the Ozone Layer that would curb heat-trapping hydrofluorocarbons. Stern hinted that tomorrow's announcements could touch on that ongoing process and on the effort to establish a market-based mechanism for commercial aviation emissions. Greens say they want to see momentum for new policies emerge from the meeting. "I think this agreement or this upcoming summit will send a pretty important signal to whether or not a North American climate agenda is going to be very positive and very forward-looking or whether it's going to be incremental steps going forward," said Jake Schmidt, International Program director at the Natural Resources Defense Council. Anthony Swift, director of NRDC's Canada Project, said, "I think that the world is looking for an increase in ambition and action from both the U.S. and Canada." One area where the summit might produce something ambitious is on electric vehicle deployment, he said. And a commitment to better integrate the grid to allow renewable energy to move between the United States and Canada would help lift the Canadian clean energy sector out of its current slump, he said. Swift, who wants the Trudeau visit to signal an end to Arctic petroleum development, said that broad commitments now could lead to action in the coming months. The two countries are due to meet later this spring at the North American Leaders' Summit with Mexico. "I would say if we don't get that [drilling pledge] and if it is simply a reiteration of commitments that have already been made in other forums, then that will be a disappointment," he said. But Erin Flanagan, director of federal policy for the Pembina Institute, a Canadian clean energy think tank, said she doesn't expect Trudeau and Obama to roll out a detailed bucket list of climate deliverables. "It's the wrong expectation for a state dinner," she said. She is assuming the summit will build on February's memorandum of understanding among the United States, Canada and Mexico, in which the North American countries pledged to share information and best practices about energy and climate resilience. But she said the Obama-Trudeau gathering will still be momentous "because in Canada, for 10 years, we had a government that wouldn't talk about climate change." "So from our perspective, engaging with our No. 1 trade partner on that issue is incredibly important, particularly with the leadership that the Obama administration has shown in the lead-up to the Paris Agreement and on domestic measures for supporting renewable energy," Flanagan said. Cathleen Kelly of the Center for American Progress released her own proposal for what the United States and Canada should agree to -- including existing source rules for oil and gas development. But she said tomorrow's meeting will also have symbolic importance. "I think both leaders are really excited about this opportunity to launch a new era of climate change cooperation and clean energy collaboration between the two countries," she said. "It not only sets the stage for an ambitious continental climate change and clean energy agreement at the North American Leaders' Summit later this spring, but it also lays the groundwork for both nations to put forward more ambitious climate goals in the future to live up to their Paris commitments."